Let's keep the reports rolling, today we move on to the middle infield and Second Base. This is a good group, with very different types of players. No major surprises, but one major disappointment. Who will be turning double plays for the Brewers may come into importance for the big club sooner than later, with Rickie Weeks STILL an unknown quantity (can he bounce back from another major wrist surgery?). Within the second baseman group we have lead off hitters, unknowns, and of course one slammin' Canuck. Starting at the bottom, Brownstein gets the nod at the fifth spot. This could easily be an interchangeable spot next year but in the meantime he makes the list. 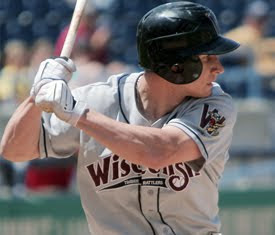 Picked in the 14th round, Brownstein saw time with four different levels of the Brewers system, including a five game stretch with Huntsville at the end of the year in which he hit .375, overall he hit .299 in 68 games. Still, 68 games is not a big enough sample size to get a great read on a player. Iribarren lands fourth mostly on the argument of what you see is what you get. Yes, he has hit for average at nearly every level of the minors, but he also has never hit for power and isn't a run producer. He'll likely be a utility player in the majors at some point. Previously I mentioned a disappointment and that would be Cutter Dykstra. His sophomore season was not good. After struggling in Center Field for Wisconsin he was moved to second base and sent down to short season Helena. For the year he hit just .234, but 2010 is another year, and the potential is there - it just needs to be realized. Eric Farris might be one to watch, though he's been a very streaky hitter. He's an interesting prospect because his game is well-suited to that of a lead off hitter, this year he hit .298 with a .341 OBP and 70 stolen bases. I'm not saying he's the second baseman of the future, but if the team decides to trade Brett Lawrie, you could do worse than giving Farris a chance. And then, of course, there is Brett Lawrie. Critics say he didn't have as good of a year as he should have but I disagree whole-heartedly. Remember, Lawrie didn't play a professional game last year. So he started his pro career at Low A and still hit .274. Add in the 36 extra base hits and 65 runs driven in and you've got a solid first season. What's most encouraging about Lawrie is that he held his own in a 13 game stint with Huntsville at the end of the year, batting .269. He's considered an advanced hitter, and his defense will have to catch up. It would not be a shock to see him assigned to Huntsville to start 2010. Aside from Lawrie, Dykstra would be the only prospect in the bunch that you could label a "high-ceiling" player, though he has yet to show much. Even so, Iribarren and Farris might turn out to be solid major league players if they get a shot. I'm not saying they're locks to be contributors, but definitely worth watching.